Akina Nakamori (中森明菜, Nakamori Akina, born on July 13, 1965) is a Japanese female pop sangster an actress. She wis ane o the maist popular sanger o the 1980s in Japan. She is kent for her deep, powerful vyce. ↑ Eremenko, Alexey. 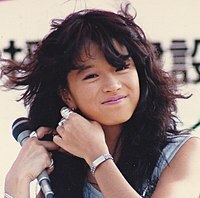 "Biography: Akina Nakamori". Allmusic. Retrieved 10 April 2010. This page wis last eeditit on 1 Mairch 2018, at 00:38.